May God save us from all these medical practitioners, it was reported that, Ex-Governor of osun state, Senator Isiaka Adeleke was killed as a result of drug overdose injected to him by a nurse, the allegation on the motion is still on but now, a nurse injected a young girl of 8years-old an injection noted to be for ” Malaria” and right now, the girl is suffering from tedious skin burn. 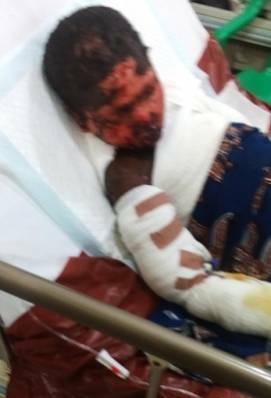 It happened at Federal Medical Center, FMC, Owerri in Imo State where this 8-years-old girl named “Ifeyinwa” is currently suffering from severe burns due to an injection she received from a nurse. According to the report reaching us, The 8-years-old girl has fallen sick some weeks ago and her aunt took her to see a nurse who has a chemist shop around their house. On getting to the nurse’s shop, the nurse told them that the kid is suffering from malaria and she proofed the symptoms. Immediately, the nurse gave the kid an “anti-malaria” injection and her body started to react steadily to the injection which later leads to burning of some parts of her body.